Autumn is often associated with melancholy. The leaves fall from the trees leaving them bare and stark, skies turn grey, and many people turn inward, both physically and mentally. The soft, gentle touch of Lipice Lipbalm offered an opportunity to address the harsh mood and dry conditions of Autumn with a message of love. 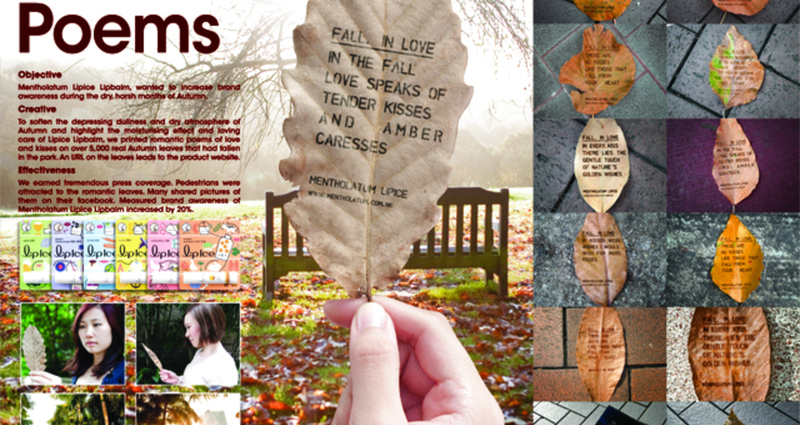 To achieve this, we created romantic Leaf Poems and printed them on over 5,000 real, fallen leaves from the park with gentle messages of love and kisses to draw people’s attention to our lip balm. We also provided a link on the leaves to the product’s website. Mentholatum LipIce Lipbalm, wanted to increase brand awareness and encourage people to love their lips with their lip balm during the dry, harsh months of Autumn. The main challenge was to gather sufficient golden fallen leaves to create a romantic ambience, especially in a city like Hong Kong, where there are not many trees in the first place. Keeping park sweepers away so more people could pick them up was another challenge.